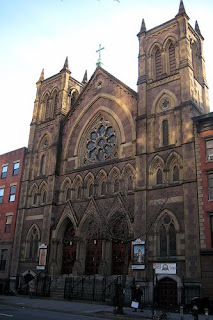 Taco NYC: Sundays at Our Lady of Guadalupe at St. Bernard's Church 330 West 14th Street Between 7th and 8th Ave. The lady with the little cart rocks. I had a chicken and a chorizo taco here. Tortillas are perfect. Self serve on the toppings - fresh cilantro salad/salsa, limes, two nice sauces and a really friendly crowd at this place.